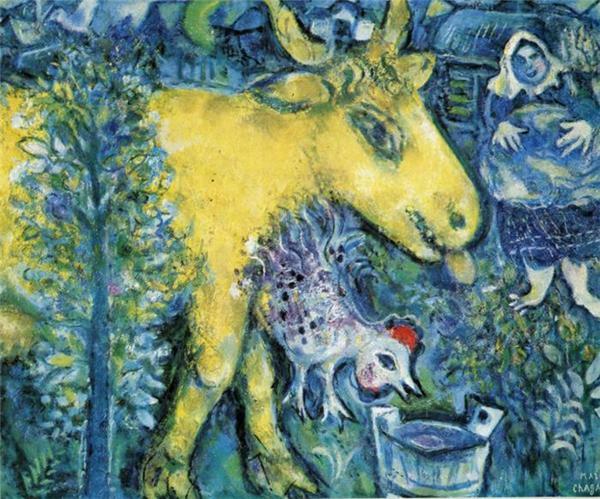 The Farmyard, by Marc Chagall, 1962 (image via Wikimedia). A side event at the Tropentag 2014 International Conference, being held at the Czech University of Life Sciences, Prague, Czech Republic, tomorrow, 18 Sep 2014, from 1400–1530, is being organized by the International Livestock Research Institute (ILRI). ILRI is a not-for-profit institution conducting research for development. Working with partners worldwide, ILRI sees livestock as potent instruments for transforming livelihoods and rural economies in developing countries. Focusing on pro-poor, global and researchable issues in livestock development, ILRI aims to serve others as a reliable resource, a catalyst for change, an enabling partner. ILRI is a member of the CGIAR Consortium of Agricultural Research Centres, working to reduce rural poverty, increase food security, improve nutrition and health, and manage natural resources sustainably. This year, 2014, ILRI have about 700 staff and an operating budget of around USD83 million. Our headquarters are in Nairobi, Kenya, and we have a principal campus in Addis Ababa, Ethiopia, as well as some 17 other regional, country and project offices in East, West and Southern Africa and South, Southeast and East Asia. The instrument creating ILRI as an international organization was signed in Berne, Switzerland, on 21 Sep 1994, and the centre started operations on 1 Jan 1995. ILRI is thus 20 years old this month. This year also marks 40 years (20+20) since the creation of its forerunners—the International Laboratory for Research on Animal Diseases (ILRAD, Nairobi, Kenya, in 1973) and the International Livestock Centre for Africa (ILCA, Addis Ababa, Ethiopia, in 1974). To mark these anniversaries, ILRI’s board, management and staff this quarter are highlighting the ways in which livestock research greatly advances the global development agenda, specifically for sustainable food and nutritional security, economic well-being and healthy lives. ILRI’s event at Tropentag 2014 is the first of a series of events marking ILRI@40. This is appropriate, given the longstanding relationship of the institute with the European community, and Germany in particular. (ILRI currently has seven staff from Germany, two of whom were former CIM experts, and ten on-going or recently finished projects involving German funding and collaboration, with a total value just over USD7 million). These German-supported projects span research on animal diseases (contagious bovine pleuropneumonia and African swine fever), environmental services and food safety. German funding and expertise has been particularly essential and long-standing in supporting ILRI’s forage genebank and seed operations. In livestock research, what are the critical barriers to transformation of outputs into outcomes and how do we overcome these? See a flyer and brochure on the ILRI side event at Tropentag 2014. And please join the new ILRI LinkedIn Group for further discussions. And that’s where we invite you to answer the three questions above. And bring up any other topic on your mind! Tags: Shirley Tarawali, tropentag2014. Bookmark the permalink.